You can't oversee: Sale is here. The time when the mailboxes are completely flooded with emails from every shop you could think of, tempting you with the best goodies for reduced prices. The sale is the best time to find an excuse to stop your shopping ban and invest in epic pieces. After all, life is hard enough, and we deserve some treats! Although we all know it's a false success when we feel that we saved money when we spend some, it's causing instant joy! Summer holidays are coming closer, and the wardrobe needs an upgrade. 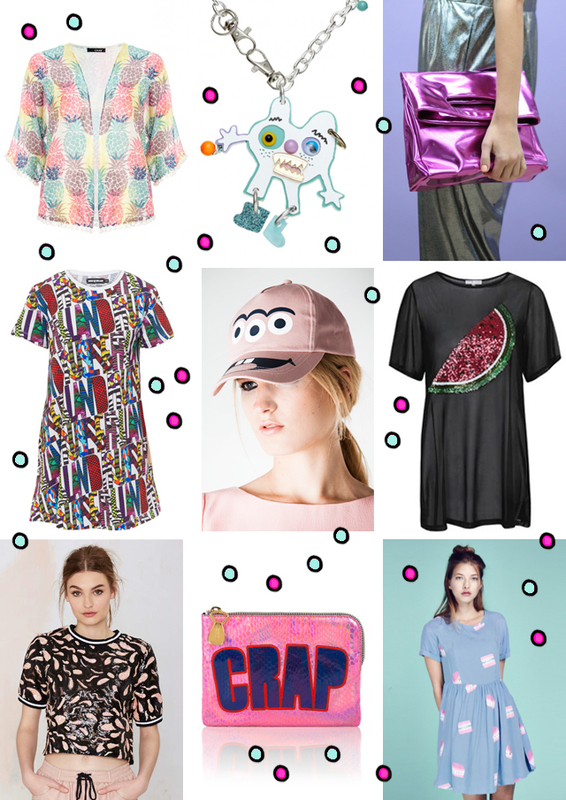 My sale favourites are shiny, colourful and cute, don't forget to tell me which are your favourites! So what are you waiting for? Make a bargain and have a happy day! Looking like a rainbow makes me feel like a rainbow! If somebody asks me about my favourite colour, I say "rainbow". 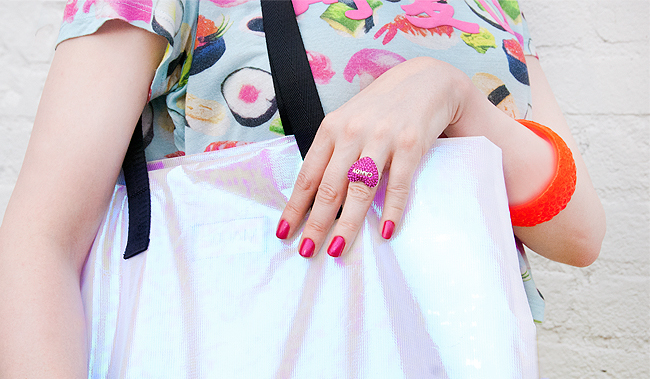 Look how my iridescent bag plays with the sun. Finally found the yellow skirt I was looking for ages. The colour is so bright; it's almost neon. 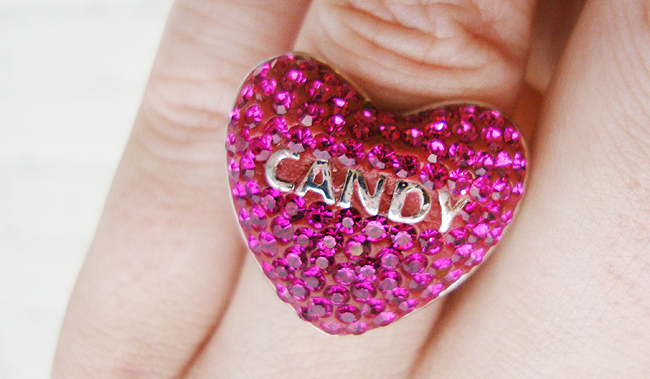 Because we all want candy (and glitter)! 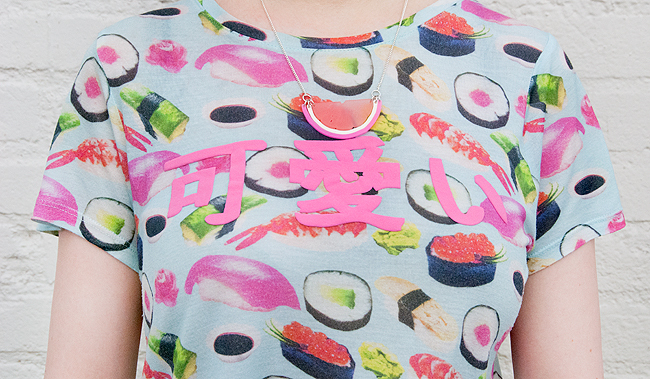 Oh, the Japanese writing on my top says "cute"? How charming! 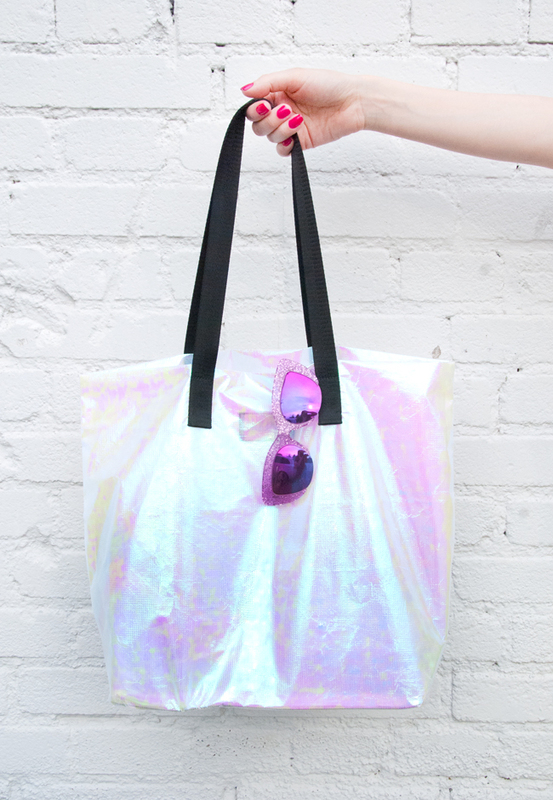 I just love shopper bags, and this iridescent one from Maude Studio is the coolest. 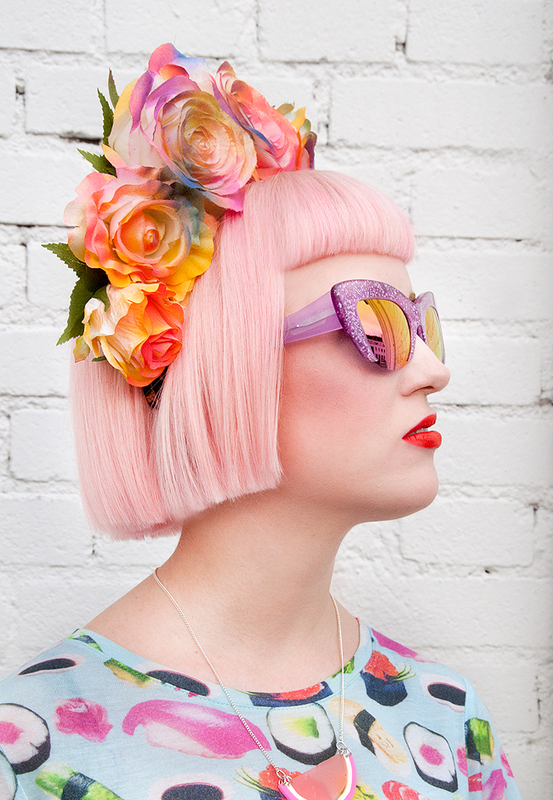 How to look fabulous: Wear a flower crown and mirrored glasses! Rainbow power from head to toe, this is how I rule! 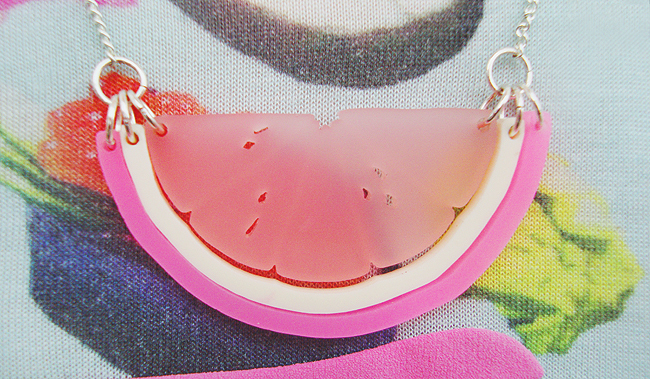 So in love with this pink citrus slice from Tatty Devine. 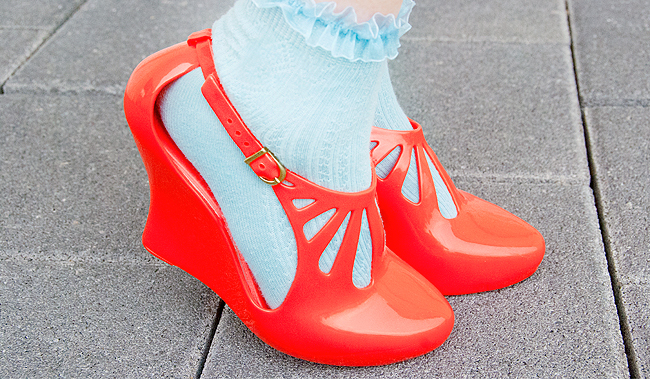 Every cute look needs jelly shoes and cute socks. My wardrobe must be the dream of every five-year-old girl: There are boxes full of fascinators, loads of flowers, pompoms and novelty handbags in fruity shapes. Not to forget a whole cupboard full of Barbie-like jelly high-heels. Some not fashion-conscious people might think I buy my jewellery and cutie-things for a few quids in cheap stores, but they are completely wrong. What an insult! Learn now and forever: There are worlds between cheap crap and quirky perfection. Kitsch isn't always just kitsch, and there is nothing more exciting than buying the right kind of it. It's worth every penny to buy something that makes the heart beat faster. Just because I can spend a lot when I'm excited doesn't mean that I'm a lavish girl: I am reluctant to spend money on some things, even if they would make my life easier. For example, I'm still using an iPhone released almost in the stone ages. Couldn't I get a new one instead of craving for another shiny Maude studio bag and an even bigger Pearls & Swine fascinator? Yes, I could, but where is the joy in buying a new phone? I want to buy something I can stare at for hours because I love it so much. A new phone doesn't fulfill the criteria at all: Everybody has one, and they all look nearly the same. It might be faster than the one I have, but it will not come with abilities like an app to create rainbows on the walls of my rooms or an instant glitter-up-my-life function. A new bag has the power to make me squeak and jump into the air on the other hand. So it's an easy decision how I'd prefer to spend my hard earned money! I go for things that give me a piece of this -being-in-wonderland-feeling and takes me out of the everyday routine. I think this is what we are all craving for in the end. How do you like this look lovelies and what do you think about spending money on quirky things? 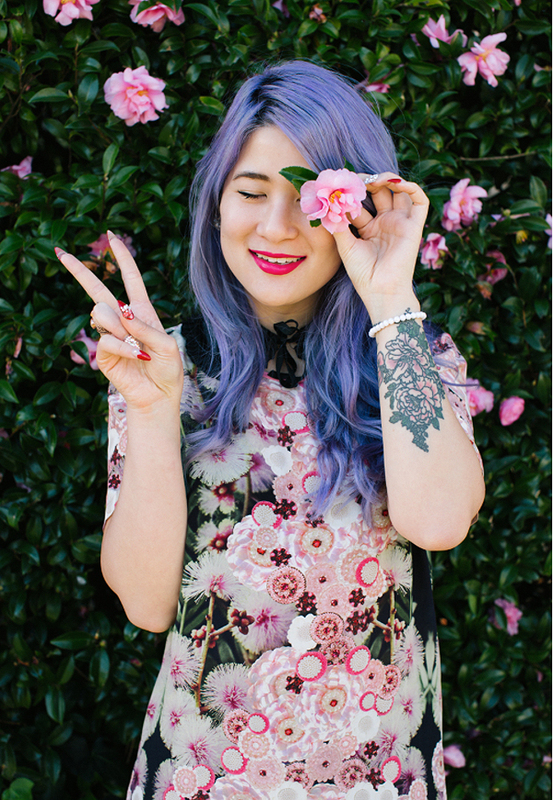 A pastel flower dream with a perfect dress by Emi from Emi Unicon. 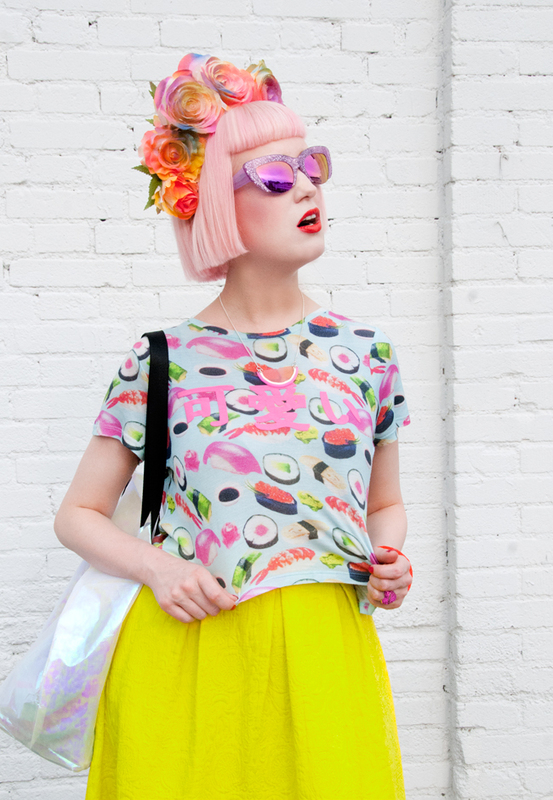 Shoreditch girls just know best how to rock vintage! Seen at The Street Style Carousel. Hayley just rules! Every single one of her looks is perfect. Seen at Fashion Hayley. 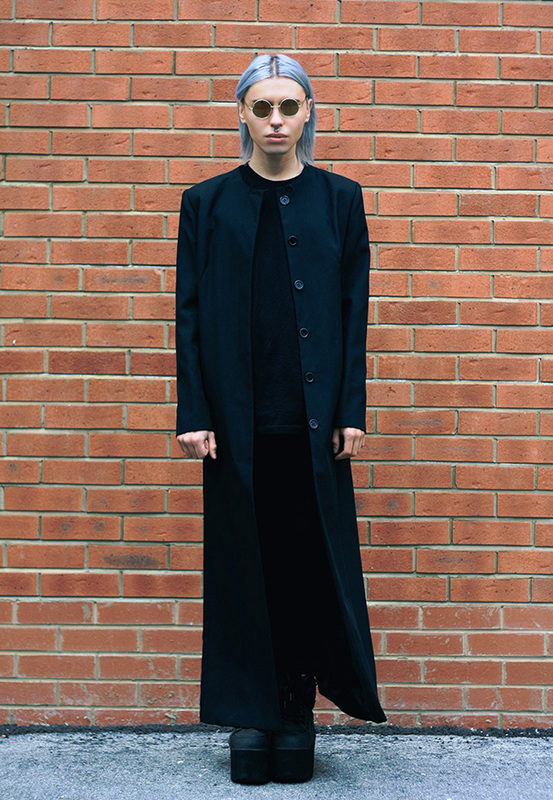 First ever menswear look on my blog. But Milex's look is just too good to not share! This hair, this colour combination! 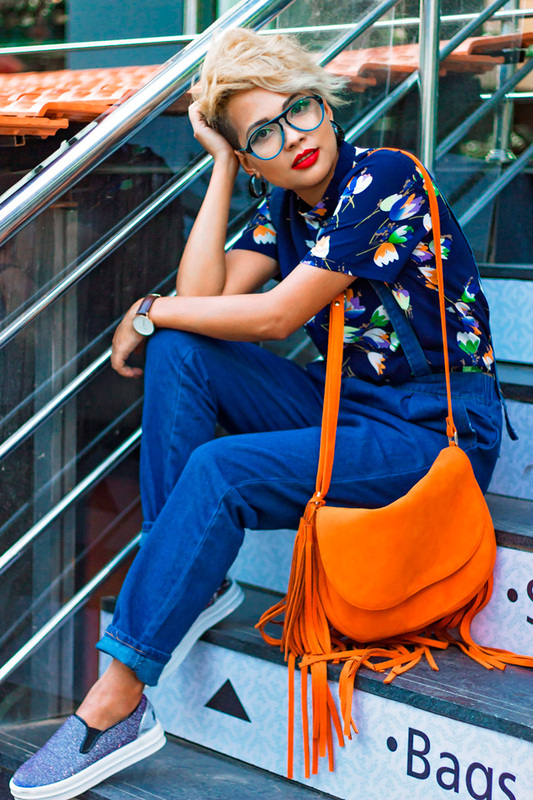 Seen at Big Hair Load Mouth by Indian blogger Nilu. How cute is this pompom look by Rommy? Seen on her blog Rommydebommy. My sweet Anne-Sophie is looking like a queen from another world. Seen at Cycle in Heels. 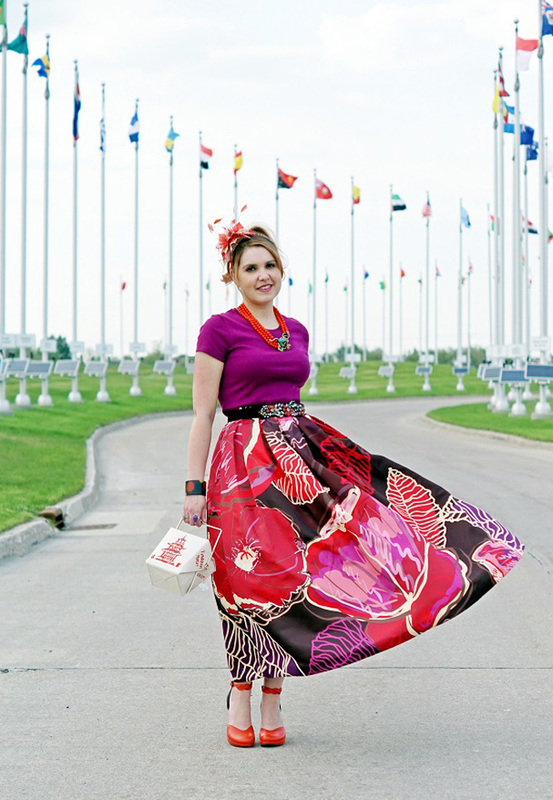 Rebecca in an amazing maxi skirt and with a cute Asian food bag on her blog Winnipeg Style. 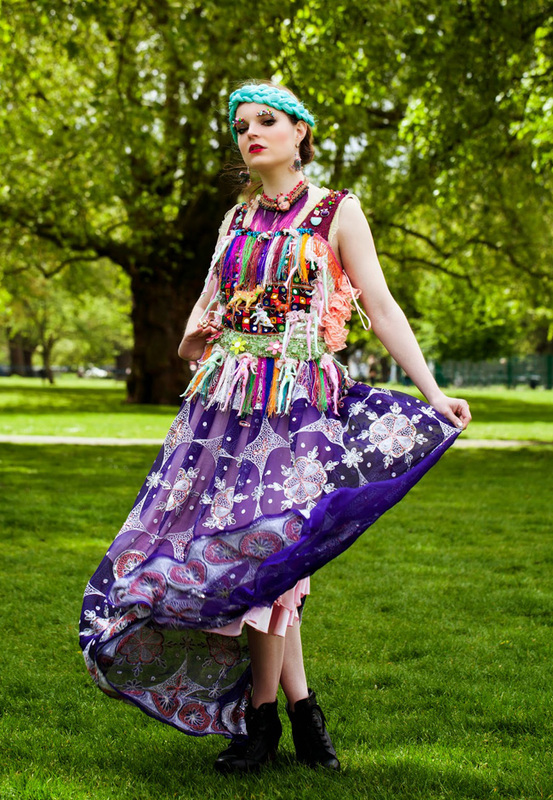 Oh, my: It's already the middle of June and I didn't manage to post a fashion favours post for May. Recently I struggle a lot to keep up with my blog schedule. There is just so much going on at work, and very often I come home almost too tired to lift a finger. Do you know this feeling when everything you desire is to sleep? I decided to not post a fashion favourites post a month anymore, but as soon as I have a selection of looks you shouldn't miss. Today this moment has come and what a gorgeous selection I have for you! What I like best about my fashion favourites is that they show, how international inspiration has become thanks to all the cool blogs out there. Today's looks are from the UK, Canada, the Netherlands, India and Australia. All those bloggers approaches to fashion are very different, and this is what I love about them. I think the secret of style is to stay open-minded, absorb a wide variety of inspiration like a sponge, and never stop trying new things! How do you like this looks lovelies and who is inspiring you most? Nobody ever complained about flamingos being pink, why should it be different with girls? It shouldn't be a contradiction to have colourful hair and work in the job you're qualified for. 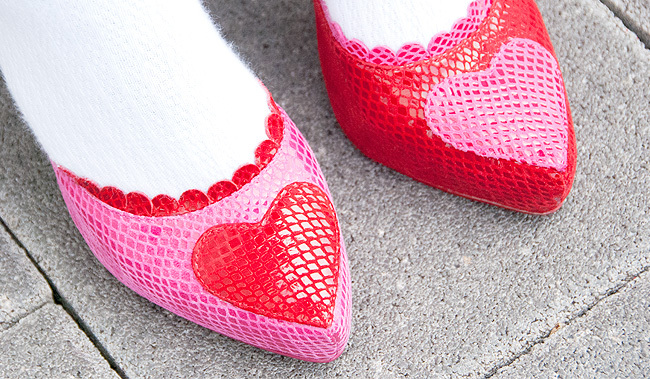 Wearing two different shoes together is no sign of craziness, but of being fashion forward! 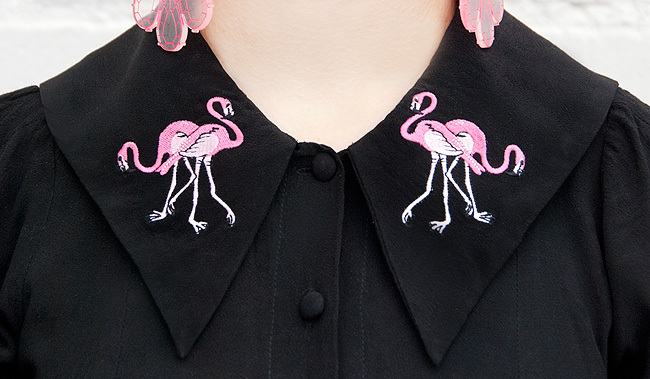 Wearing a collar, but never a boring shirt! Hello, my name is Sara. What can I do for you? Pinks hair is an instant cause of happiness; you should try it! I give you my heart if you take me the way I am: A crazy fashion gal. Yin and Yang is set as a philosophy, so it should be for shoes! If you are my client, you might meet me in this outfit. Maybe just without the fascinator. Try to wear what makes you happy and do what fulfils your life! 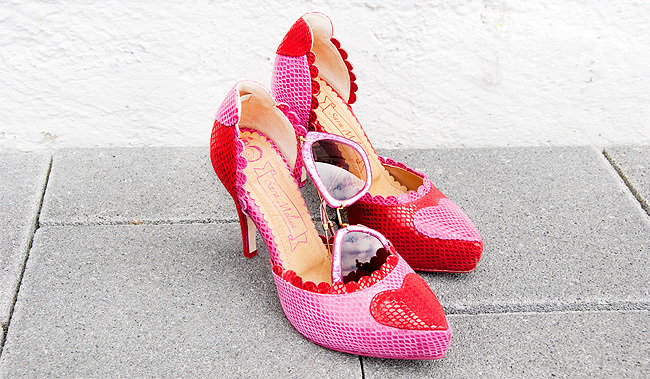 Last advice of the day: Invest in good shoes and cool glasses. They will bring you far. Pink haired girls do not look professional, are offensive and will have no serious career! While we speak with holograms, have robots hoovering our homes and even transplant whole faces, mankind has a serious problem: There are a few troublemakers disturbing the introspective society with their unnatural hair colours. What a scandal! 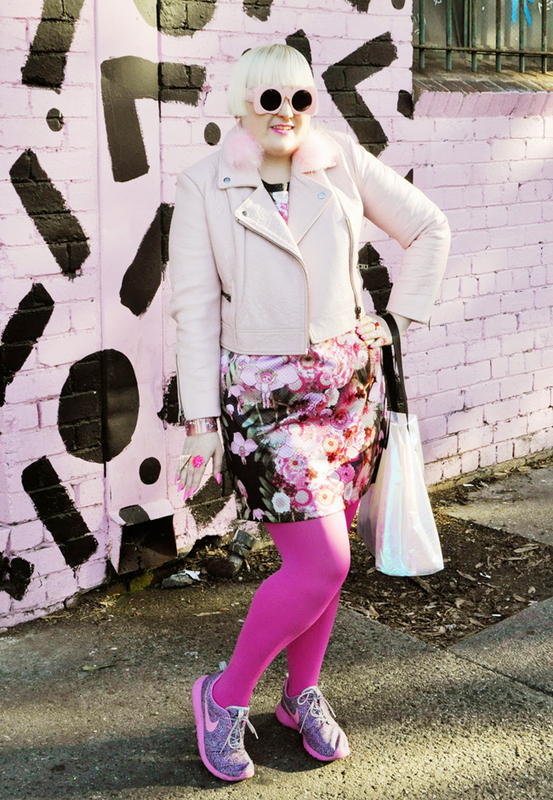 Jessica Chelsey wrote a great post about the difficulties of finding a job with colourful hair and inspired me to talk about this topic too. Jessica dyed her gorgeous blue hair back to dark because she was urged to by an employer. Since then she doesn't feel like herself and sees it as discrimination to be forced to change her appearance in this way. When you consider how hard mankind fought for freedom during its whole history, colourful hair sounds like a ridiculous thing to raise tempers, don't you agree? My experience as a girl with a candy floss mane is, that growing a thick skin is the price for having your dream hair. People are making jokes about my hair, children are screaming "Katy Perry" whenever I appear on the street and my mother had a very hard time getting used to have a pink-haired daughter instead of a blond angel. Sometimes it feels like my pink hair is what the red flag is to a bull in the arena. Some people overslept the takeover of rainbow hair by fashion and still believe, you have to be either a punk or a goth to dye your hair any other colour than a mousy brown. But, and here comes the but: In my experience my hair was never in the way of my career. Part of it might be because I work in a creative job and this gives me a certain freedom to look the way I choose. But it's also because there are amazing people out there who are capable of distinguishing the skills of a person and her hair colour. A big thank you to my bosses at this point; you are amazing in counting on what matters: My qualifications. I work as hard as any blond or black-haired girl if not harder. As head of design of a branding company, I meet a lot of clients, not all of them the most fashion forward people. But nobody ever complained about a pink-haired girl in a sea of suits and I am proud of every client who is intelligent enough to know that hair colour doesn't destroy brains. Having the job I am qualified to AND my pink hair makes me happy and this in turn makes me do a better job. 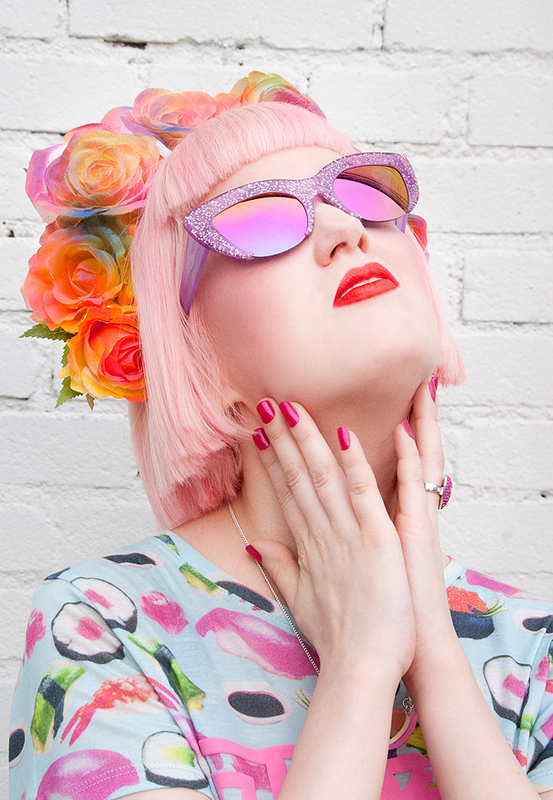 I think the world is ready for a gang of colourful girl bosses in 2015! Follow me, everybody of you shall be a drop of colour. We can achieve change together and stand for more tolerance and open-mindedness. The day is close when everybody laughs about colourful hair being an issue at all! Are you lonely sometimes or just in the need for more cuteness in your life? Then these bags and keychains are waiting for you to keep you company! One is cuter than the next; my dream is to have all of them and start a little zoo of pretty creatures. 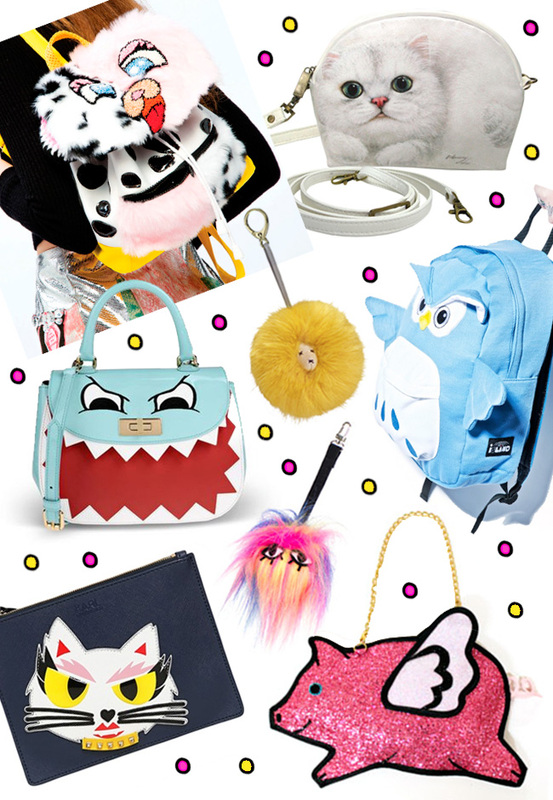 Life is too short for boring bags! Carry around some joy and never grow up entirely! Your inner Peter Pan will agree and have a lot of fun, carrying a furry creature or a hungry shark with you and have that perfect "what-else" expression on your face. 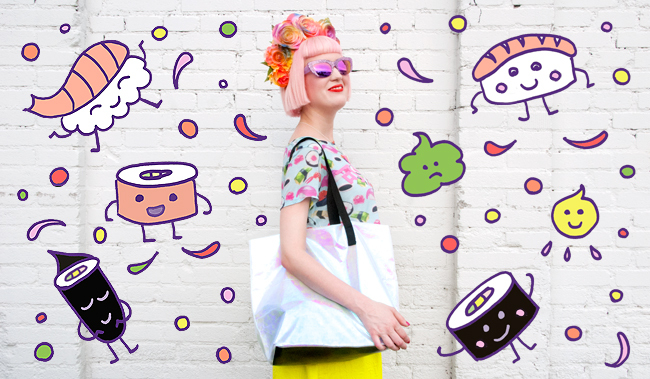 I think cute bags hold kind of a precious super power: They can make even the grimmest people smile. Just observe the reaction of people on the street when somebody with a flying pig on his shoulder crosses and you will agree. Which one of those bags is your favourite?